A series of exhibitions shedding light on the arts and culture of Korea’s modern era kicked off late May at two of Seoul’s most-frequented museums, revealing how Korean artists have shaped their own expertise and identity over historical adversities in the late 19th and 20th centuries. The Deoksugung Palace Annex of the National Museum of Contemporary Art reopened its doors on May 26, following months of renovation. The building has undergone a process of architectural restoration and refurbishment based on historic research to better accommodate its new role as a representative art institution specializing in Korean modern art. For its reopening, the museum brought in two special exhibitions: a large-scale retrospective of the late Lee In-sung -- marking the centennial celebration of the artist’s birth -- and “Poetry and Dreams,” which features a selection of modern masterpieces from the museum collection. Lee In-sung (1912-1950) is a critically acclaimed artist from the early 20th century, who in his time had been dubbed a genius by the Japanese press. Perhaps Lee may not be a name that would ring in the minds of contemporaries, as most of his artwork was long kept in the hands of private collectors. Lee has however been at the center of attention among art historians for creating a remarkable artistic legacy and establishing a profound engagement in visual realization and exploration of the native hue. The current exhibition is an extensive survey of the oeuvre of Lee In-sung, encompassing different stages of his career, from pastoral scenery to portraits. The retrospective also presents a vast collection of archives and historic records that will allow viewers to browse the annals of history in association with shifts in artistic trends and experiments under various artistic movements. The artist, who studied western art in Japan during the colonial era, has sought to express elements and perspectives of Korean art, fused with his sentiment about the hometown. The current exhibition features hidden masterpieces including some unveiled for the first time in a public institution. “We are delighted to present an exhibition shedding light on artist Lee In-sung as the first in a series of special exhibitions dedicated to showcasing modern masterpieces since the reopening of the Deoksugung Palace Annex,” said NMOCA Director Chung Hyung-min. “The exhibition is of much significance, especially to art historians and field experts but also to general audiences as Lee’s works -- which are rarely on view in public spaces -- may be easily understood by anyone, arousing heartfelt passion and emotions. An exhibition not to miss as it offers a rare occasion to appreciate the extraordinary vision of this great artist, who extended the definition of “Korean-ness” during the colonial period. 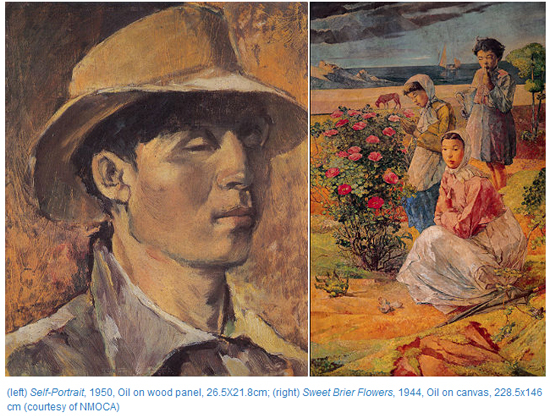 From September to December, the centennial celebration will travel to the Daegue Art Museum in in Daegu, the birthplace and artistic hometown of the painter. Exhibition view of "Modern Masterpieces from the Museum Collection: Poetry and Dreams"
Also taking place in the museum’s second-floor galleries is “Poetry and Dreams,” a showcase of the highlights of the museum’s collection covering the beginning of the 20th century until the 1950s, a period of Korean history marked by turbulence and hardship. Works by great masters including Lee Jung-sup, Park Soo-keun and Kim Whan-ki are on display alongside poetry that reveals the essence of the times and the dire circumstances. On May 25, the National Museum of Korea also reopened the Joseon Dynasty V Gallery after undergoing a partial renewal of its permanent galleries dedicated to representing the final part of the museum’s Korean history series. “The Empire of Korea and the Modern Era” showcases the modernization of Korea, as well as artwork and relics from the end of the Joseon Dynasty, the Empire of Korea, and the colonization period. The exhibition begins with a description of the advent of the Empire of Korea during which modern ideas and concepts were introduced to Korea together with a variety of Western goods. On view at the exhibition rooms are the seal and medals of the Empire of Korea, a locomotive, phonographs, cameras, and telephones, all of which attest to the dramatic changes in people’s quotidian lives. A number of texts, visual records, and images of the era published by western visitors to Korea at the time illustrates of the country from a different, genuine perspective.